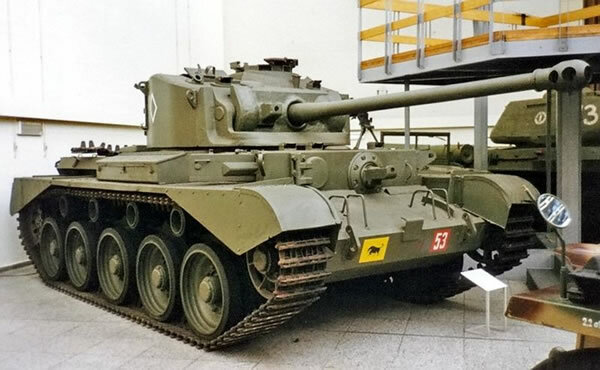 The British World War 2 Comet Tank was finally the tank that could match the firepower and mobility of the deadly German Panther tank, however it was only ready in 1944, by which time the Normandy landings and invasion of Germany had been well under way and the Comet was way too late in its deployment to the field to offer any significant advantage for the Allies. Production of the Cromwell had been taken over by Leyland from Birmingham Carriage and Leyland worked on an improved version now known as the Comet. The Comet fielded a new compact 76mm main gun (later a 77mm), a new stronger suspension gave an improved off-road capability, electrical traverse for the turret and armoured storage bins for the ammunition, as well as new exhausts. First vehicles arrived in December 1944 and the 11th Armoured Division in March 1945. It remained in service until the early 1960’s with the British Army as well as with Burma, Finland and South Africa until the mid 1970’s.